All search engines like Google and Bing use algorithms to display content that is ranked based on what the search engine decides is most relevant to internet users. These algorithms use hundreds of factors to decide which websites are ranked higher than others, and some factors have more weight than others. Search engine optimization, or SEO, is the process of increasing both the quality and quantity of the traffic your website receives from organic search engine results. Search engines do not publish which factors their algorithms use, although high-ranking websites share many factors in common. 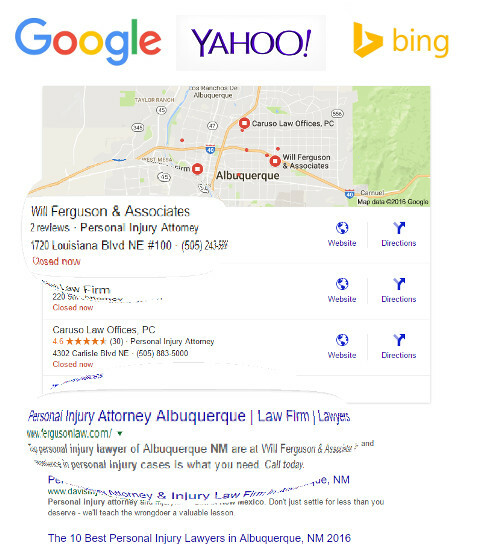 The following are some of the most important SEO ranking factors that Performing First will address to help your law firm’s website improve its organic traffic and visibility. Backlinks are links to your firm’s website from other websites, such as a chamber of commerce’s website, an online directory, or a local newspaper website. It is nearly impossible to rank well for competitive search terms without backlinks. In the past, the sheer number of backlinks your website had was all that was important. Today, the relevancy, authority, and variety of your backlinks are more important. Google analyzes your backlinks to decide if they come from websites relevant to yours. It’s also good to have backlinks from many types of websites, including directories, educational websites (.edu), news sites, chambers of commerce, and more. It’s important to have many internal links within your website to decrease your bounce rate and improve overall experience. Google considers how pleased visitors are with search results in its algorithm. A common means of determining user satisfaction is looking at your website’s bounce rates and how long visitors stay on pages. Google places a big emphasis on quality content over keyword-heavy spam or unoriginal, filler, or plagiarized content. Useful content that offers value is rewarded with higher rankings. This is where an attorney blog that offers fresh insight and coverage can be helpful. Google and other search engines also consider the length of the content on each page of your website. Studies have found that the longer the content, the better it will rank on Google, assuming it is valuable content. How often is your website updated? Google considers how often you publish new content and update old content to rank your website. On-page SEO elements are also important. This includes title tags that are relevant and include the main keyword of the page and meta descriptions that are optimized with a description of the content. Other important elements of on-page SEO include image optimization, the use of H1, H2, and H3 tags, and the use of bulleted lists to make content user-friendly. At Performance First, we combine years of experience and an in-depth knowledge of search engine algorithms to help your firm’s website rank well on Google, Bing, and Yahoo through better SEO practices. We strive to remain at the forefront of the latest SEO strategies and search engine algorithms while constantly tweaking your website to help you maintain the results you achieve. Contact Performance First today to get started with a cost-effective search engine optimization strategy to help your firm reach its goals and increase the visibility of your website.